I recently was trolling, ah, lurking? No, perusing an online group for religious filmmakers. One member very passionately made the argument that we (believers) shouldn’t make Christian films until we have all the resources in place to do as good a job as our secular counterparts. On the one hand I can totally see his perspective. The last thing we need is more bad Christian movies. We’ve got enough of those. In his argument we should wait until we have the resources, the technique, the ability to create something that isn’t sacrificing quality. I agree with quite a lot of that. But I didn’t do what he suggested. I made a series for stupid cheap money, and even wrote an ebook encouraging others to follow suit. Obviously I’m not on the wait-until- you-have-everything bandwagon. Am I wrong? Should I have waited until the show could have been done for $50,000 an episode? Or maybe $25,000? What is the magic number, anyway? It shouldn’t be bad Christian vs good secular, it should be bad vs good. Is it fair to compare low budget Christian films to blockbuster hits and Oscar winning secular films? Are bad Christian themes movies really any worse than bad secular films? There’s plenty of bad non Christian film made. Lots of them. Tons of low quality short films and even a feature length products that friends and family watch, but almost no one else. In our case, Christian audiences are more accepting of lower quality because of the message. That may say more about Christian audiences than Christian filmmakers. But bad films are bad films. Period. Our problem is that we, as believers, excuse the flaws, and allow bad religious fare to become widely known. Bad secular films just fail. Regarding the original argument, I agree that any filmmaker should do their homework. If you have not bothered to learn basic script structure stop read this right now and go buy Save the Cat by Snyder and Story by Mckee. Immediately. Don’t rush into production because you don’t want to take the time to learn how to be good. There are too many resources out there to learn how to be a better filmmaker. But there are not as many resources of a more tangible sort. To make a film or show you need gear and people and places. I believe that if God has placed a burning desire to tell a story in your heart, he has also put the resources to accomplish that vision around you. But most of the time that does not mean you can pull off a movie with a $2 Million budget. Most of the time you won’t have big name actors in your film. Does that mean you should wait, and not work on your dream? I keep thinking about the parable of the talents in Matt 25:14ff. If the talents symbolize the resources and abilities God has given us, this parable seems at odds with not moving forward because you don’t want to disappoint God. Imagine, the master returns and asks what I did with the talents he has given, and I say that I knew he was a hard master so I didn’t take the small amount he gave me and create something more, instead I waited. I hid it away and wished I had been given more. Will his reaction be different than the parable? What if instead I took what small amount if resources I was given and used them to the very best of my ability (which he also gave me). And while we may not have seen five talents in return, we did see one come back. If you are interested in religious films then you have surely heard of a church called Sherwood Baptist in Albany, GA. Have you ever watched their first film, Flywheel? This is a prime example of small amount being used to great effect, and God returning more and more throughout the cycle. Are any of their film Oscar worthy? No, but they get better each time, and people watch them. At the 2014 NRB convention I heard one of the producers, David Nixon, say that their film Fireproof has been credited with helping to save 1 Million marriages. (They know this from messages they have gotten from people who were affected by the message of the film). What if they had waited to do Flywheel? So when I think about the argument that we should wait until we can make something amazingly good, I want to agree. But mainly because I am afraid. I am fearful about doing something so big. If only I could be content to wait. That would be easy. I’d be working a job that paid decent, and quietly pining for the moment what all the pieces fall together and I can make my magnificent movie. Dreams are safe if you never do anything about them. What if God has given me a story to tell. And I wrote the best script I can, and then get the best gear and best cast and crew, and we make it. And it’s not 100%, more like 80%. But people see it. Or what if God gives me a story to tell and I spend years waiting until I’m ready to deliver 100%. Which one has more impact? Which one will allow me to gain experience and knowledge so the next project can be better? I’ve been meaning to post the link, but have been slammed with prep for the 2014 NRB Convention. “An award winning Christian sitcom produced and broadcast around the world for under $9000? Yes, it can be done. Find out how a former Media Pastor led a cast and crew of volunteers to create a non traditional religious program that was seen on multiple networks, stations and satellites. Learn what you need to know about the Christian TV market, writing and producing your own show, and then getting it on the air for FREE! It’s actually been selling more than I expected. $3 isn’t much to ask, and I hope a lot of people will be interested in the subject. We need more non traditional religious TV shows! This morning I submitted my first eBook to Kindle for publishing! 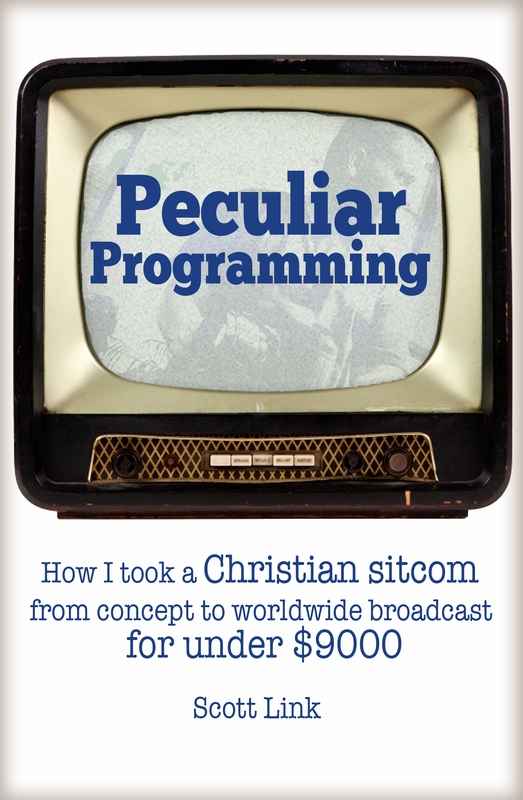 14,502 words, 12 chapters, about how I took Peculiar from concept to worldwide broadcast. I cover everything from the Christian TV market, to writing and producing the show, to getting it on the air for free. Find out more info at www.peculiarprogramming.com. The book is in review right now, but will be available on Kindle in the next couple of days.